The kids saw a Fatheads commercial not long before we left Florida. One of the commercials had A. Rod or Derek Jeter. I’m not sure which it was, but Jacob started drooling at the TV set. But wait, Fatheads are EXPENSIVE! 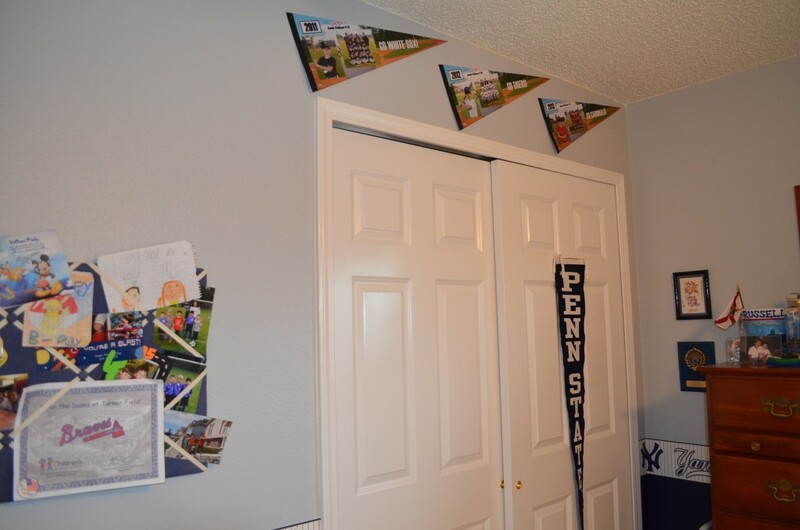 Jacob was interested in the Yankee Stadium one, and the best I could do would have been about $85. Then we could really open up some other options. 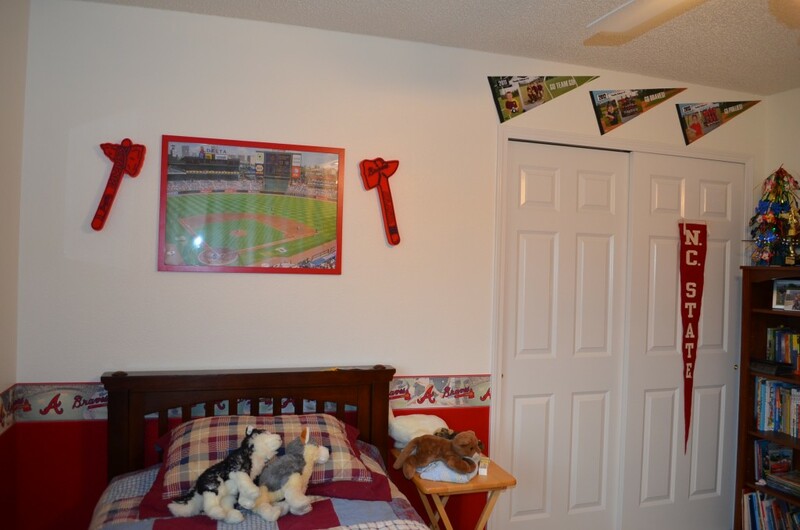 For less than $200 per room, we were able to fully design MLB bedrooms for our boys. We used border paper to make it truly unique. Here’s how we did it. 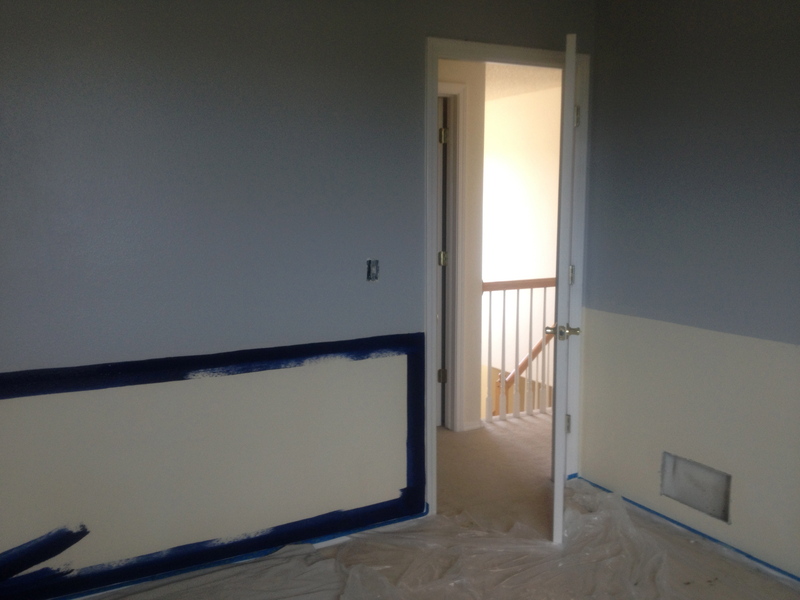 We needed two gallons of paint — one gallon for each of the two colors we were going to do. 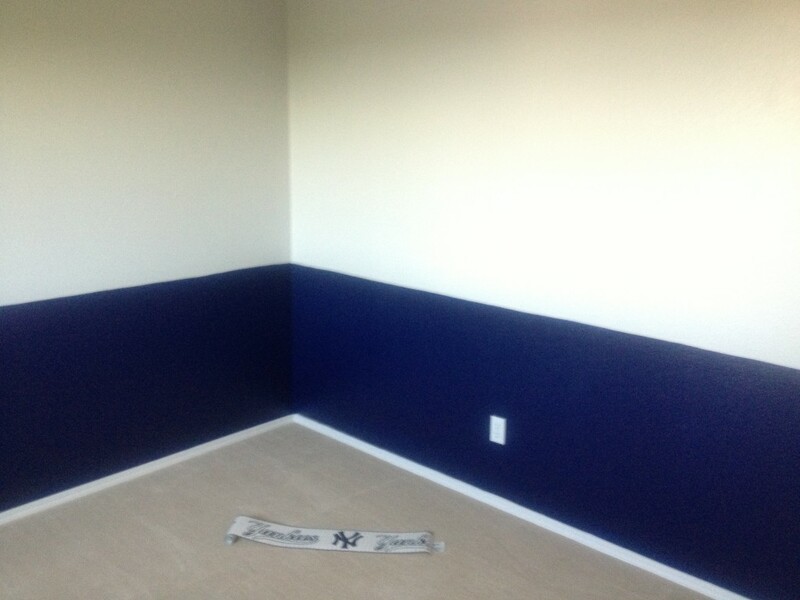 We figured we’d be putting grey on the top for both rooms, then navy blue for the Yankees room and red for the Braves room. 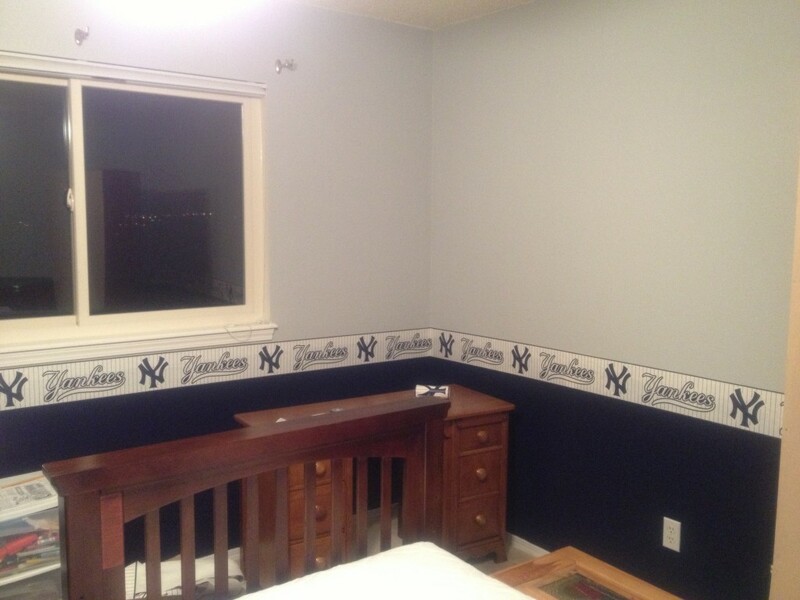 But when the grey went on the Yankees-room wall, we realized it was more of the blue-grey. 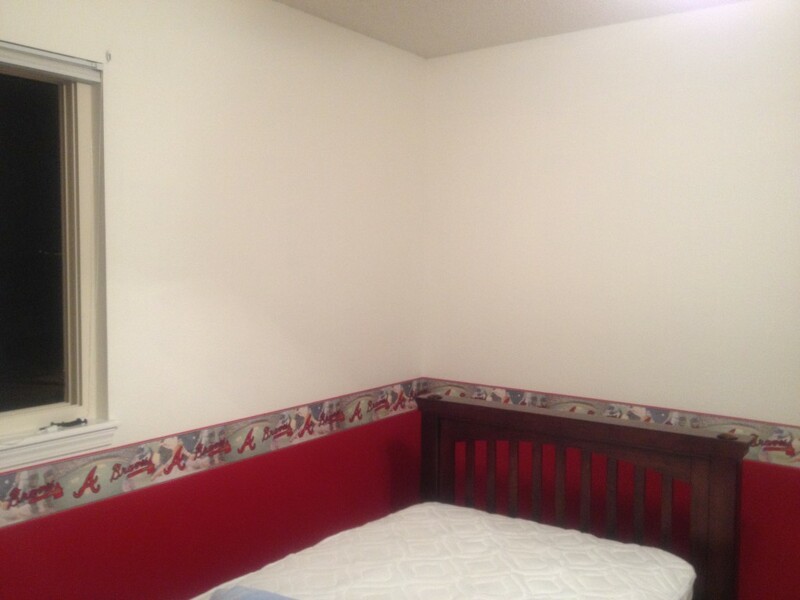 Oops, our grey color choice wasn’t going to look very well against red in Timmy’s room. We also realized the deep colors we chose were REALLY dark. I had never painted with dark colors like that before (well, there’s Jacob’s room in North Carolina, that was more orange.) It was quite scary. What if I dropped some on the carpet? The painted room. We’ll discuss the border paper momentarily. The lighting was a bit different here, so the grey looks brighter. Now, for Timmy’s room. Dave and I were fighting the clock by this point, the furniture was arriving within 24 hours! Dave ran to Home Depot and got a completely different top color: an off-white. 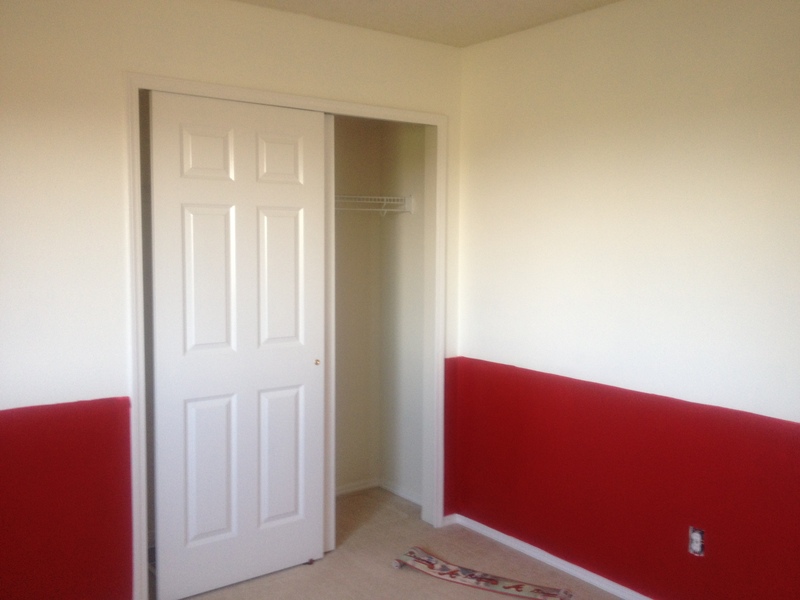 The total cost for the paint: $50 per room. One gallon of each of the two colors in each room. The border paper was easy enough. I put several options on the Pinterest board and then asked the boys which style they prefered. The Braves border paper was $8 per roll and we needed three rolls. For some reason, the Yankees border paper that Jacob chose was $14 per roll and we needed four rolls. Applying it to the walls was a challenge. Perhaps because we used satin finish paint, the pre-glue didn’t work at all. We had to come back another time with some wallpaper adhesive and try it again. It’s really on there now! 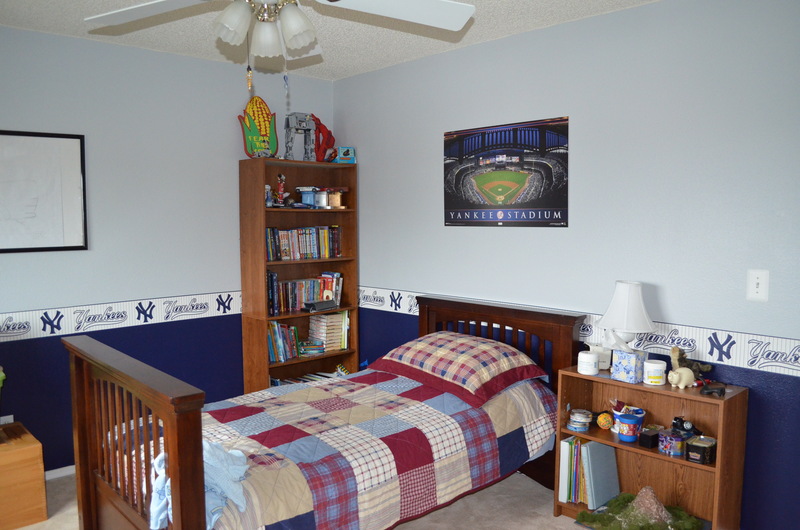 Cost: $24 for the Braves room, $56 for the Yankees room. The posters for Jacob’s room were very inexpensive. I paid less than $10 for his posters. Then I had them dry mounted for about $10 each at Hobby Lobby. 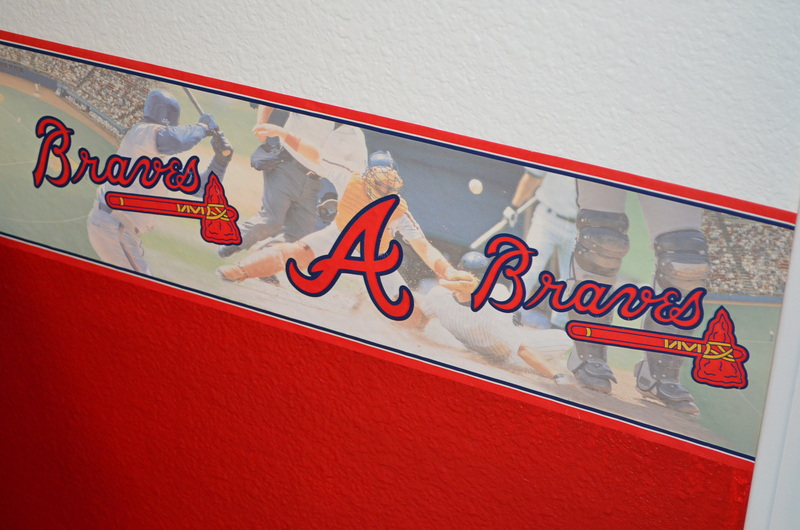 Timmy had a poster from a 2011 Braves game we went to. I had that drymounted for $10. He also wanted a Fathead of his team’s stadium. 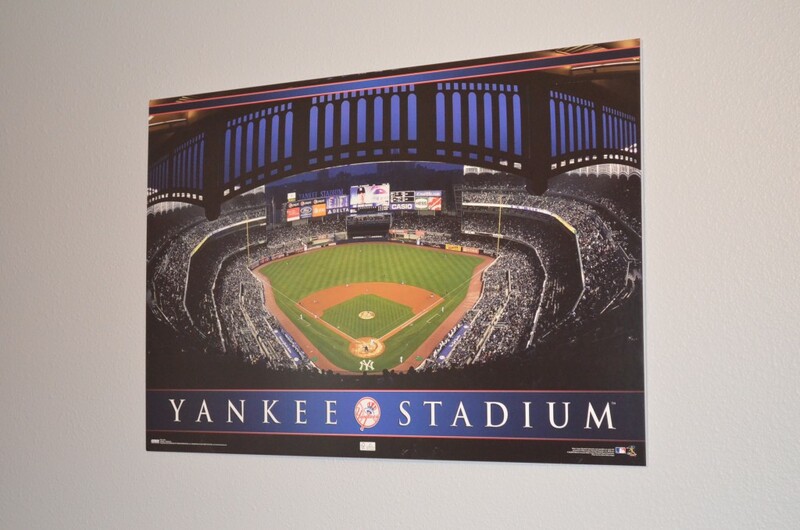 I attempted to find a poster like the one I found of Yankee Stadium. Unfortunately, I couldn’t find one easily. I had dozens of pictures from inside Turner Field. We went to games in 2011 and 2012 while we were living in Florida. I thought this one could be good for Timmy’s room. I shipped it to Shutterfly and had a 20″ x 30″ poster made for $15 (I had a coupon code). I got a red poster frame at Ikea for it. Cost: $30 for the Braves room, $26 for the Yankees room. 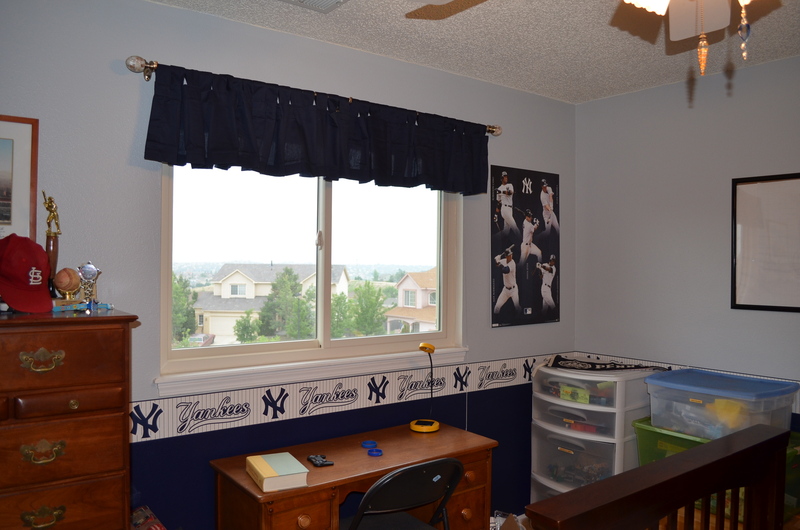 The simple navy blue valances were from Amazon. 3 panels per room, $15 per panel. I’m not sure if this is a lot or a little for a bedroom makeover. I think I did pretty well. I didn’t address bedding. 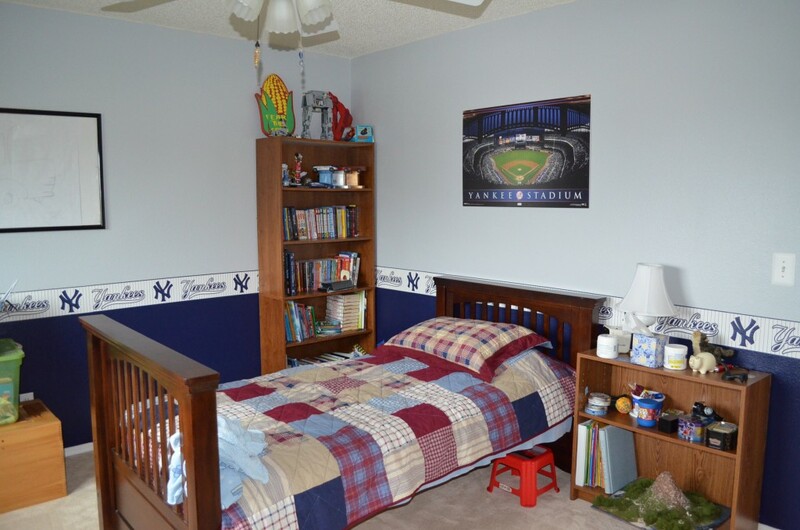 I saw some nifty bedding for each of the boys’ favorite MLB teams, which is on the Pinterest board. I also saw some nice-looking, good quality MLB bedding at Pottery Barn Kids. But even on clearance (which it is right now), it’s still pretty costly. 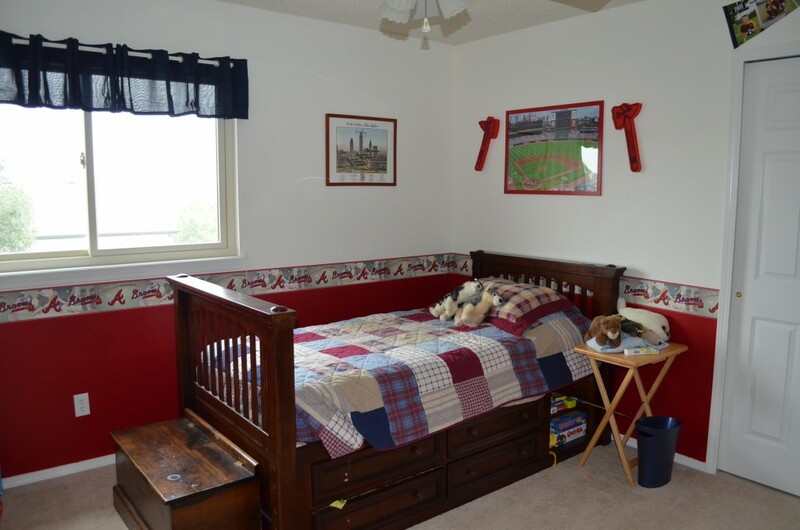 Probably $200 per boy’s bed! Now enjoy some pictures of the finished rooms. The pennants over the closet were from Timmy’s 3 years playing for Navarre Youth Sports. A closeup of the border paper. Jacob’s room. That seemingly blank poster on the left is a pencil drawing of Guido from the movie Cars. Jacob met a Disney artist on our cruise in 2011. See, we don’t need no stinkin’ Fathead!